I’ve been a fan of Baltimore’s own Chef Chad Wells, Executive Chef at Alewife, since I heard he was sauteing snakeheads in an attempt to eradicate the invasive fish and working with the Department of Natural Resources to promote menu items centered around local seafood species. Turns out his sustainable initiatives aren’t limited to the sea. 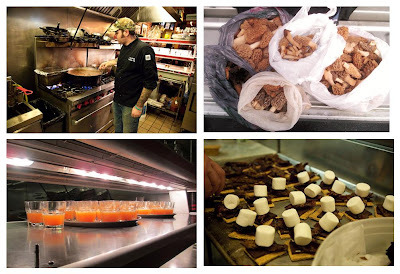 Earlier this month, Chef Wells teamed up with Joe Squared at Power Plant Live to host a “Campfire Dinner” in conjunction with the new monthly event promoting local talent called Food = Art. The inspiration for January’s event was to take people camping by using food you can kill yourself – all cooked in a way that can be duplicated deep in the woods – with limited local ingredients, cast iron pans, smoke and fire. And boy did they pull it off! 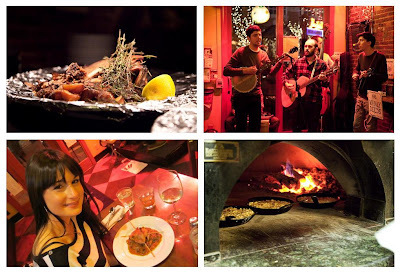 The constant-campfire vibe of the event, which included an all-evening performance of folky, old-timey, American awesomeness from The Manly Deeds, was authenticated with each family-style entree arriving in foil and with a single utensil per diner – a fork. If that weren’t enough, several people at our table were involved with the meal on a personal level. Mike Naylor, the DNR’s Chief of Shellfish Programs, foraged the morels that accompanied the trout dish. Austin Murphy, Pro-Staffer for Whackfactor Outdoors, “harvested” the main ingredient in the venison stew in Flint Hill, Virginia. To keep up with Food = Art events, ‘like’ them on Facebook. Most photos displayed in this post, with the exception of a few, are from the artistic view of Sean Scheidt See more of his images from the event here.